Sprouts opened its first Pennsylvania store in South Philadelphia. Sprouts Farmers Market has expanded its U.S. footprint to 19 states with the opening of its first store in Pennsylvania. The Phoenix, Ariz.-based fresh, natural and organic grocer on Wednesday opened a 32,000-square-foot store at Lincoln Square in South Philadelphia. As part of a ribbon-cutting event at the store, located at 1000 South Broad St., the first 200 shoppers received 20% off their total purchase, and every 15th customer is being given a Sprouts coupon book. All shoppers will receive a free reusable bag with a purchase. Sprouts said the grand opening promotion will continue over the weekend, with the first 200 customers making a purchase on Saturday receiving a coupon booklet for five free deli items and every 15th customer on Sunday getting a coupon for $5 off a purchase of more than $15. Nut barrels line one aisle of Sprouts' new store. 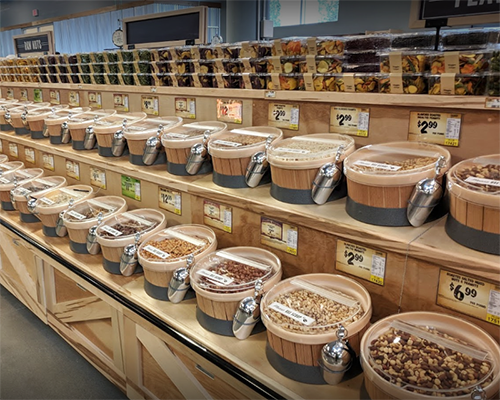 Sporting a bright, open layout, the Philadelphia store offers customers an extensive selection of fresh fruit and vegetables plus barrels of wholesome grains, nuts and sweets. The Butcher Shop meat department includes an in-house butcher who prepares handcrafted sausages daily and helps customers with special cuts of meat as well as seasoning for fresh seafood, available at the Fish Market area. The Market Corner Deli serves up freshly prepared entrees and sides, including grab-and-go lunch and dinner items. Shoppers also will find a fresh bakery, dairy, bulk foods, and 7,500 vitamin and body care items made with sustainable and ethically sourced ingredients. The store will offer locally made products from brands such as Naturi Yogurt, Vesper Brothers Foods, Trickling Springs Creamery, Really Raw Honey, Everbar and Love Beets. More than 2,400 Sprouts-brand products are among the 19,000 products carried at the store. According to Sprouts, 90% of items are natural or organic, 6,100 products are non-GMO and 7,100 are gluten-free. Pennsylvania marks the second new state entered by Sprouts in the second half of this year. The company opened its first Washington store in Mill Creek last month. Sprouts has said it plans to open 13 stores in the third quarter. Besides the Philadelphia and Mill Creek locations, they include Durham, N.C.; El Paso, Texas; Las Vegas (three stores); Oklahoma City; Phoenix; Towson, Md. ; and Lodi, Sacramento and Vacaville, Calif.
Next up are the chain’s eighth Las Vegas-area store on Oct. 3 and its seventh in Florida (Winter Park) on Oct. 24. The first half of 2018 saw the opening of 16 new stores, including the first location in South Carolina (Simpsonville) in June, which was the 300th Sprouts store. At the Goldman Sachs Global Retailing Conference in New York earlier this month, Sprouts CEO Amin Maredia said that 60% of the chain’s sales are fresh items, where the supermarket sector is seeing its fastest category growth. He also noted that his stores’ 30,000-square-foot box takes a rationalized approach to brick-and-mortar space in the online grocery era and incorporates modularity so it’s easier to adapt to changing customer preferences. Currently, Sprouts is opening about 30 new stores a year, Chief Financial Officer Brad Lukow said at the conference.